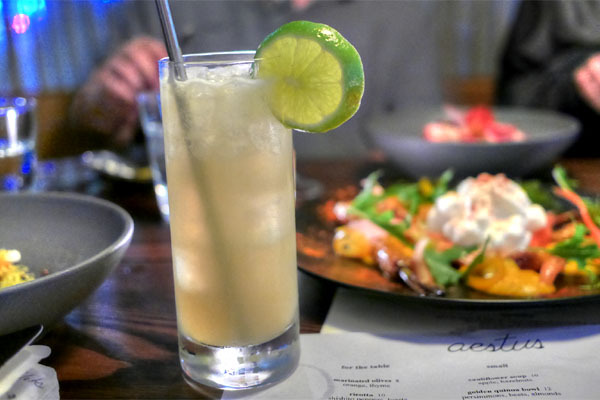 One of the latest additions to the SaMo dining scene debuted on January 8th. 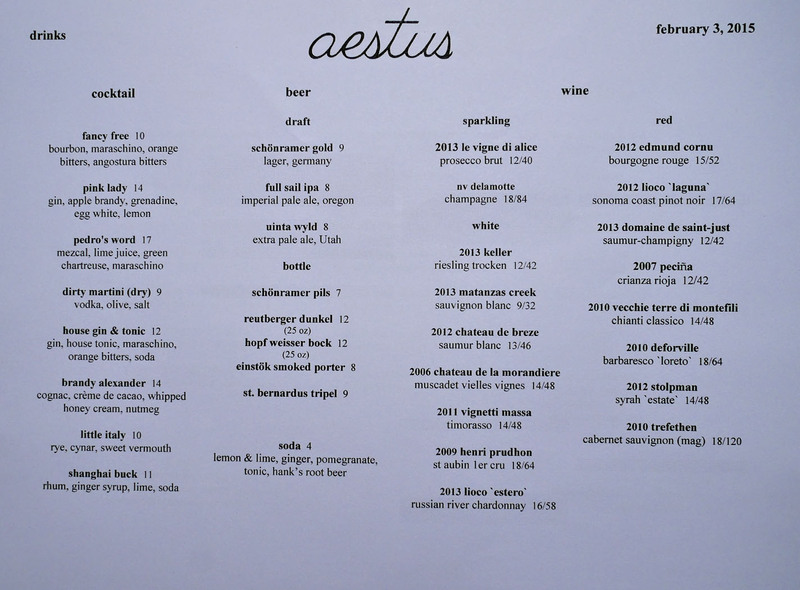 Aestus (Latin for "heat," roughly) is brought to us by Kevin O'Connor, co-owner of Lioco winery and former wine director at Spago. Helming the kitchen is Alexandre Ageneau, David Feau's right-hand man at The Royce whom we last saw at Bistronomics with Jet Tila. 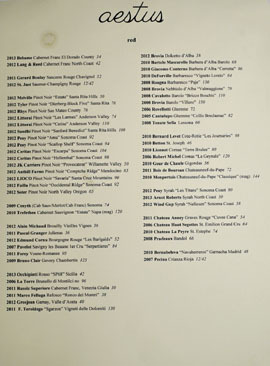 Though Bistronomics was supposed to go permanent, plans fell through, and Ageneau was then slated to become consulting chef at The Colonial, that defunct wine bar concept from David Haskell, Carolyn Reyes, and Mary Anne Reyes (situated at the current site of L'Assiette). That never happened, however, and he ended up leaving for Chicago in October 2012, becoming Executive Chef of Paris Club, a brasserie from the Lettuce Entertain You group. 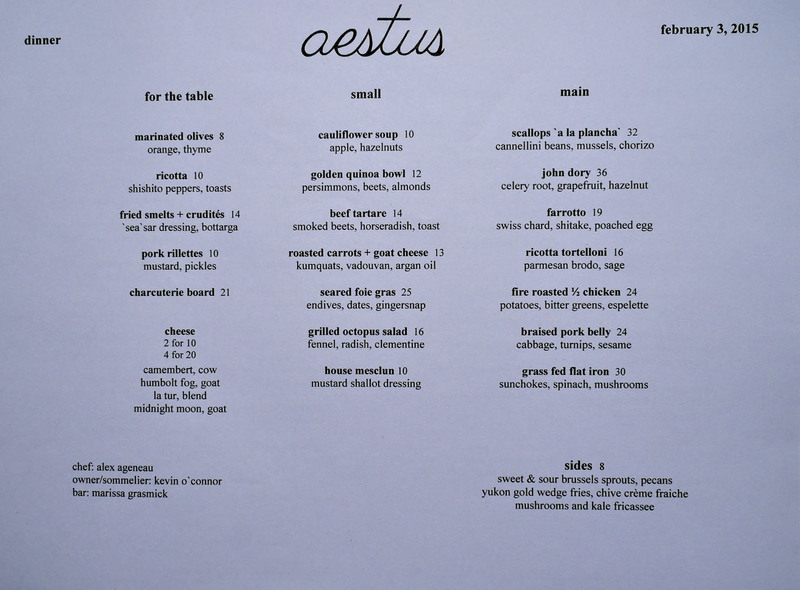 Ageneau left the Windy City in the second half of 2013, and took a consulting gig at HomeState in Los Feliz before coming to work on Aestus. Aestus occupies the bottom floor of the Arezzo apartment building, just a stone's throw from Brilliantshine. 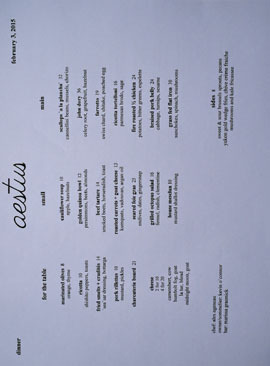 The space was penned by MASS Architecture & Design (Lukshon), and features a handsome mid-century-modern-esque vibe. There's seating for up to 60, plus another 15 at the bar. 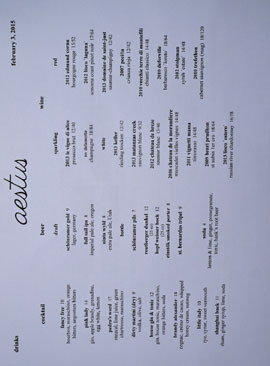 As for Aestus' menu, Ageneau's got a European-inspired, Cal-modern array of shareable plates going on. 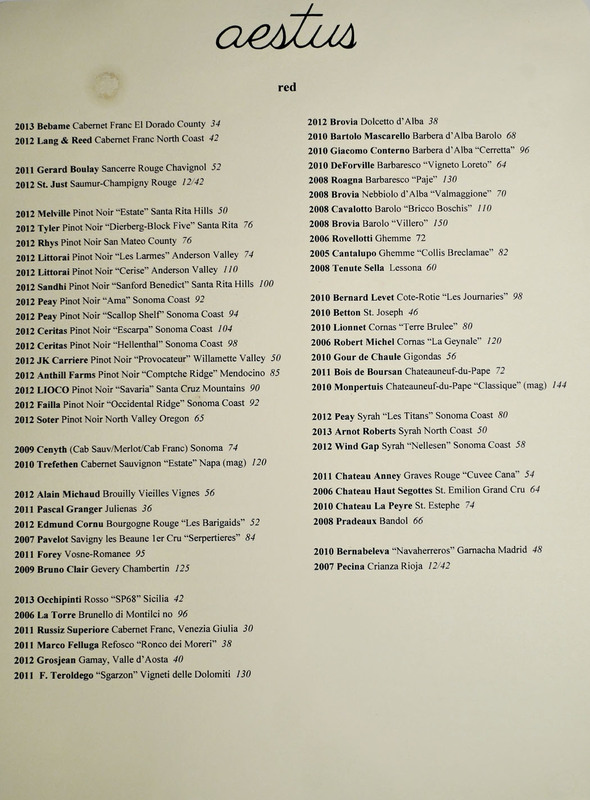 Drink-wise, O'Connor's put together a nice wine list, and cocktails come from Bar Director Marissa Grasmick, who previously worked at The Varnish at The Bitter Bar in Boulder, CO. Click for larger versions. 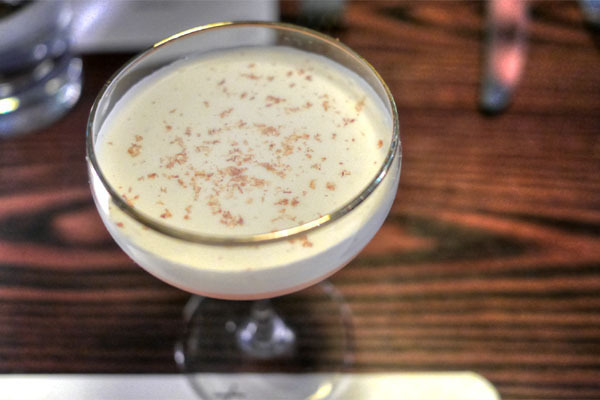 A Brandy Alexander is almost always a good choice, and Aestus' rendition was no exception. Loved the intoxicatingly sweet-n-spicy nose of nutmeg here, and how that worked with the frothy, chocolate-y nature of the drink, with the brandy peeking through just enough. Duck Pâté - Arguably my favorite of the bunch, all rich and peppery and delicious. 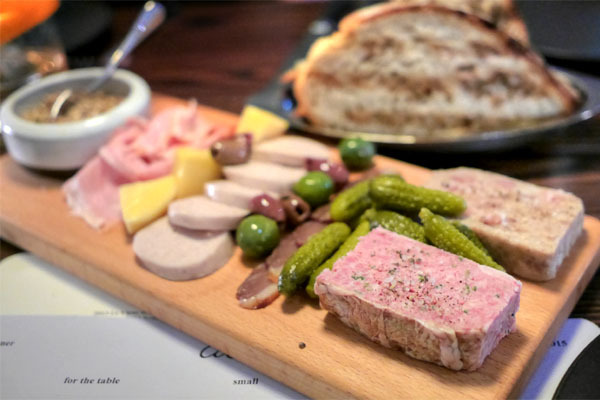 Pork Rillettes - Very porky, fatty, and creamy, with a saltiness to it, just how rillettes should be. Smoked Duck - Savory and expectedly smoky, with a good amount of fat and a satisfying chew to it. Boudin Blanc - A delicate and relatively mild pork sausage with a fine-grained consistency. Paprika Cured Ham - Salty and spicy, but well balanced and nicely textured. Our second cocktail was a bit more bracing, with the mezcal, maraschino, and Chartreuse combining to form a smoky, sharply astringent sensation accented by the sourness of lime. Fish fries were straightforward in their savoriness, amped up by the tangy dip while the bottarga intensified their natural salinity. 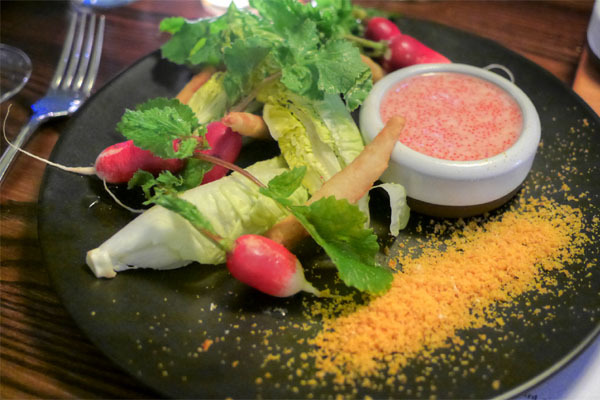 The veggies, meanwhile, were almost as gratifying: crisp, crunchy vessels on which to really go to town with the dressing. The quinoa read like the requisite "healthy" dish, but was actually much more interesting than expected. 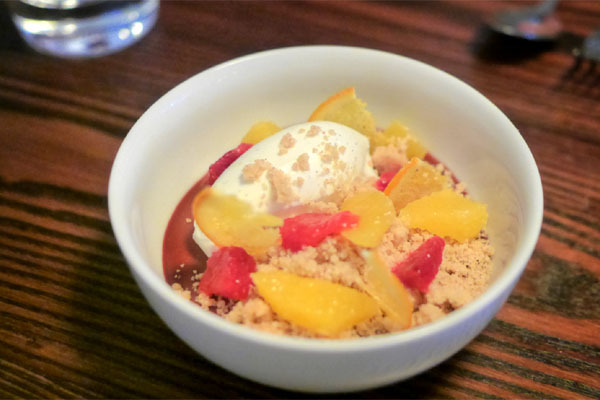 It was indeed light in presentation, but also satisfying in its combination of crunch, nuttiness, and subdued sweetness. I was especially fond of the persimmons here, which I usually don't care for. 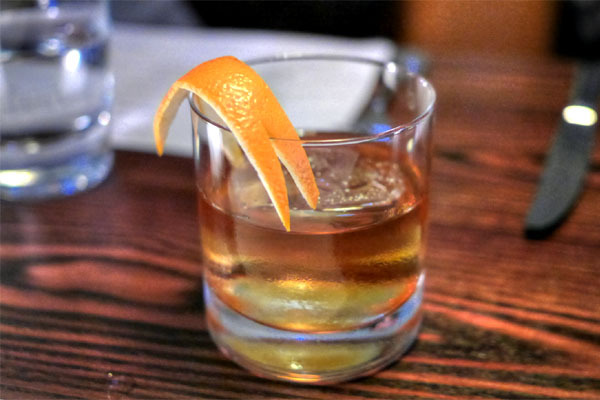 Our next drink was a modified Old Fashioned of sorts, with the sugar/water swapped out for maraschino and orange bitters. I found it expectedly classic in essence, with a beautifully aromatic nose of sweet citrus leading to a boozy, bitter flavor profile. Foie was a must try, naturally, given how deprived of the ingredient we've been over the past couple years. The example tonight was well-seared, creamy and lush, but with a nice crust to it. 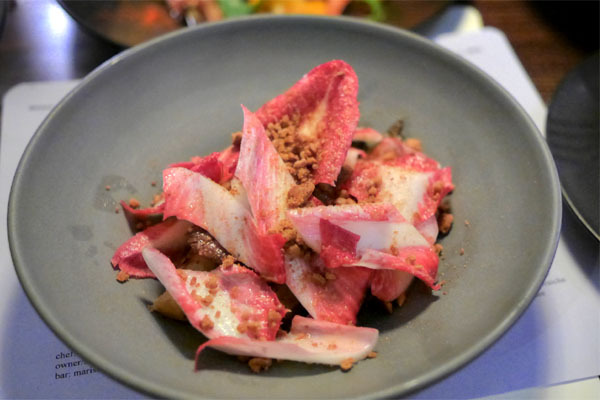 Its refined, yet focused flavors were beautifully matched to the endive, which imparted both bitterness and crunch to offset the heft of the liver. And as you can see, in terms of presentation, the Chef clearly likes to "hide his meat," a theme that would be repeated throughout the night. 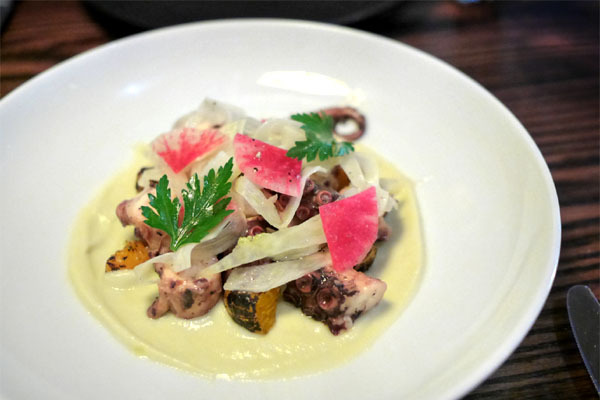 Octopus arrived appropriately tender, with its sweet-saline qualities perked up by the zip of the fennel-radish combo. I really would've liked to have seen some more charring going on here, though. 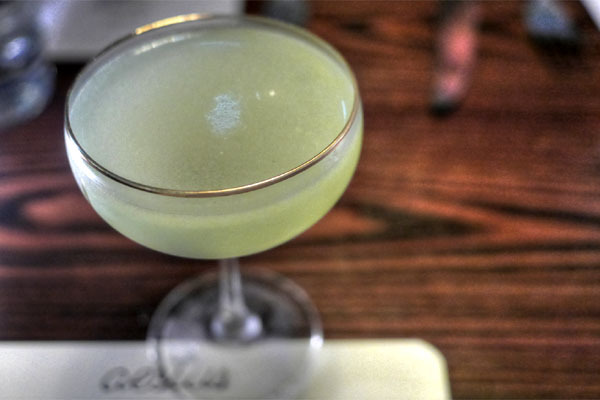 Aestus' take on the ubiquitous G&T was well-appreciated, with its classic, botanical flavors energized by bittersweet nuances from the maraschino and bitters. 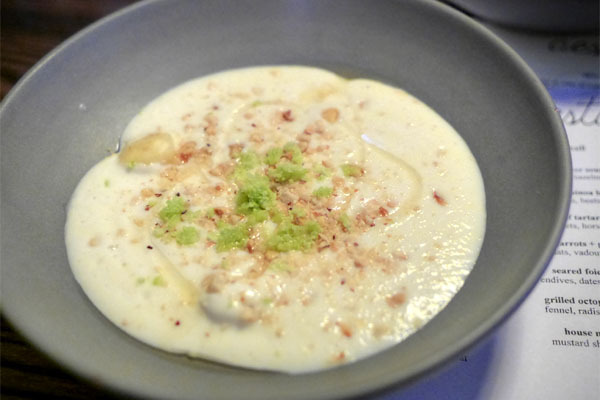 A potage of cauliflower clearly showcased the subdued flavors of one of my favorite vegetables. Hazelnuts added a much-needed crunch and nuttiness to the mix, and the slight tartness of the apple made sense, too. I wanted more depth, more richness to the soup, though. 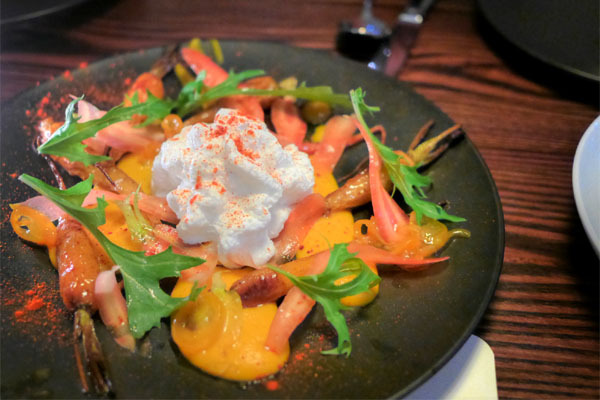 Carrots were presented in a couple ways here, with the weight of the sugary, charred examples keenly offset by the bitter, crunchy strips present. Vadouvan, meanwhile, imparted warmth to the dish, while the goat cheese gave up a light, lactic creaminess that helped tie all the elements together. 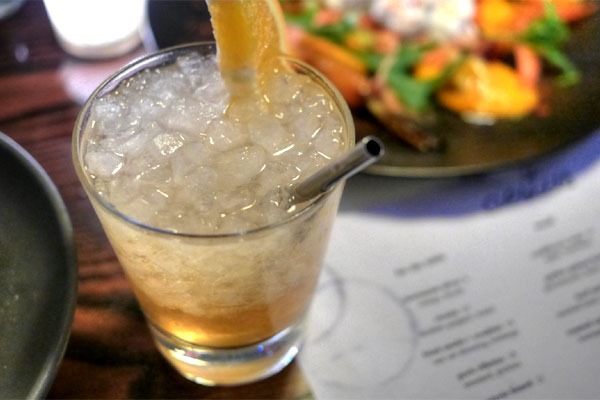 This version of the traditional buck was the easiest-drinking cocktail of the night, a light, effervescent concoction with a bright nose of citrus and spicy, creeping notes of ginger. Getting into the larger plates now, the Dory showed off its signature, sharp brine, with the fish's firm, fulfilling bite nicely played against the juicy grapefruit. 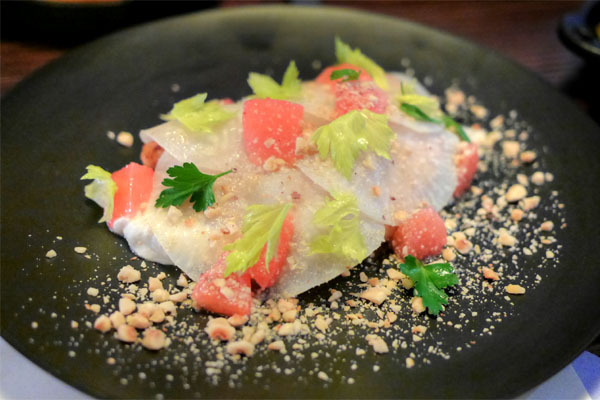 There was an overabundance of hazelnut, however, which rendered the dish too nutty. I couldn't resist the Brussels of course. 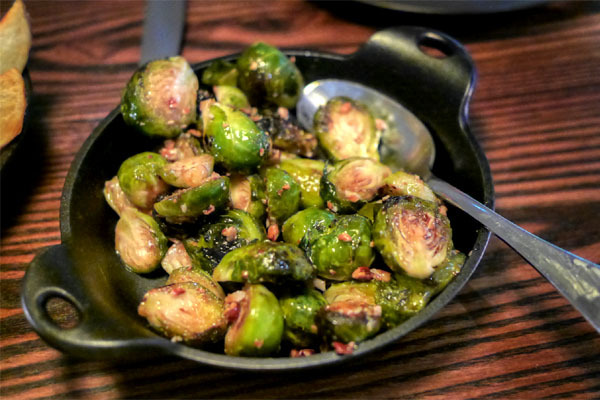 The sprouts delivered, coming out sweet and tangy, yet still bitter and well-charred. 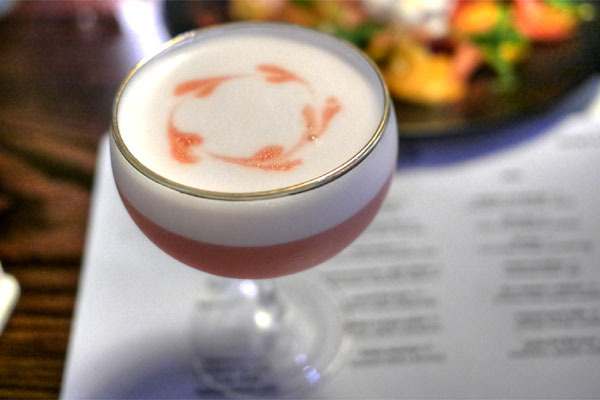 I was also quite fond of the Pink Lady, another old-school cocktail that really did a great job balancing the fruity flavors of grenadine with contrasting elements of egg, apple, and lemon, all while the gin served as a spicy base to the drink. Not nearly as girly as its name would imply. This pork was a reworked version of a dish that I'd had back in 2011 at Bistronomics. 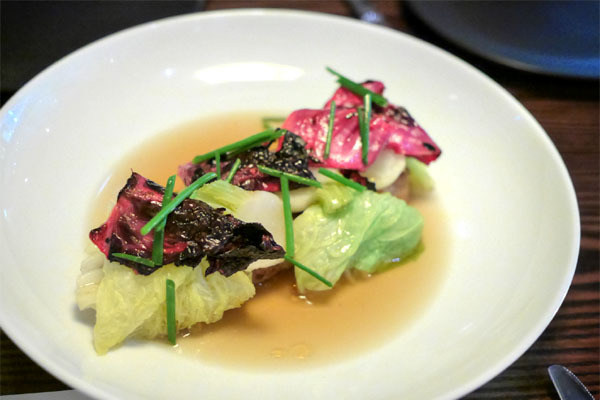 The belly was tender and toothsome, with its piggy potency countered by the bright, bitter crunch of the cabbage and turnips while the sesame-laced broth gave up a delightfully Asian-y tinge to the course. 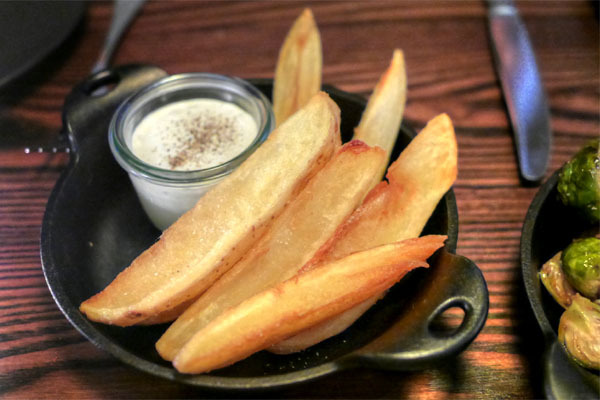 French fries were cut thick and conveyed the very essence of potato. Superb with a dab of the light, tangy condiment. 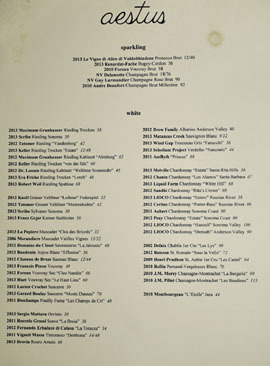 To pair with our mains, GM/Sommelier Ian Harris (from Reynard in Brooklyn's Wythe Hotel) recommended a white Burgundy, the 2010 Rollin Pernand-Vergelesses Blanc [$76]. 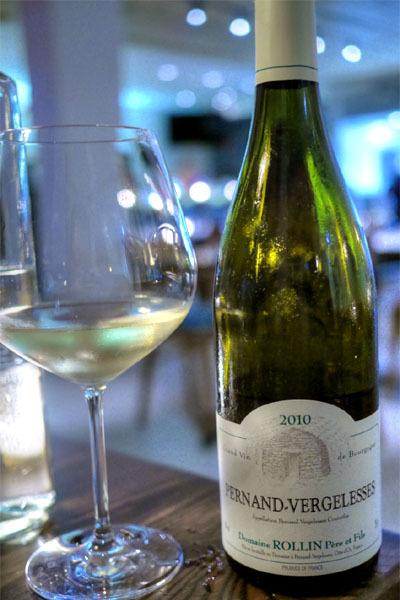 It was a delicious choice, with clean, clear floral and lemony notes abound, tempered by a crisp minerality. Very drinkable, with good length. 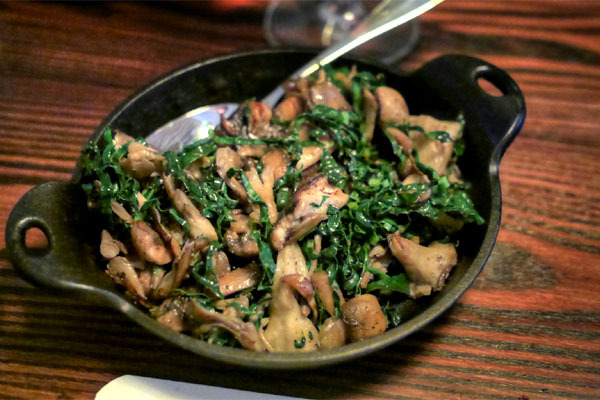 Mushrooms were the star here, their trademark earthiness foiled by the comparative austerity of kale. 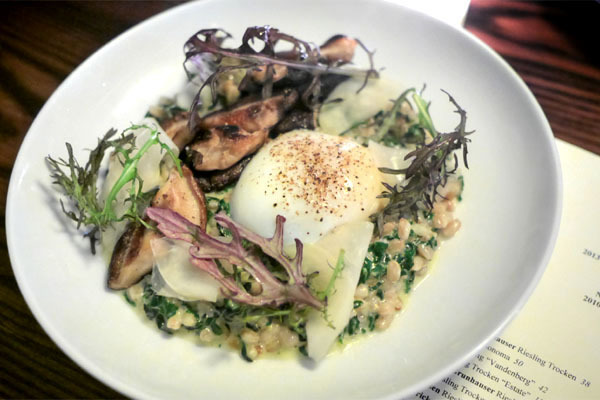 Farro risotto displayed a pleasing texture, with the soft, but still substantial grains tied together by cheese and poached egg while the shiitakes added a lovely depth to the dish. 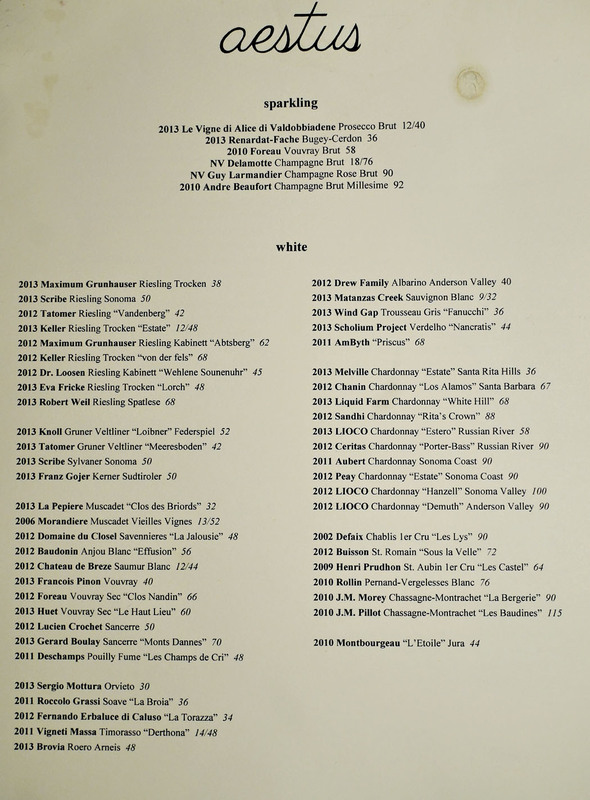 Good use of the chard as a counterpoint to boot. Our final savory brought out scallops, which came out loaded with caramelized nuances and a palpable salinity, augmented even further by the ocean-y essence of the mussels. 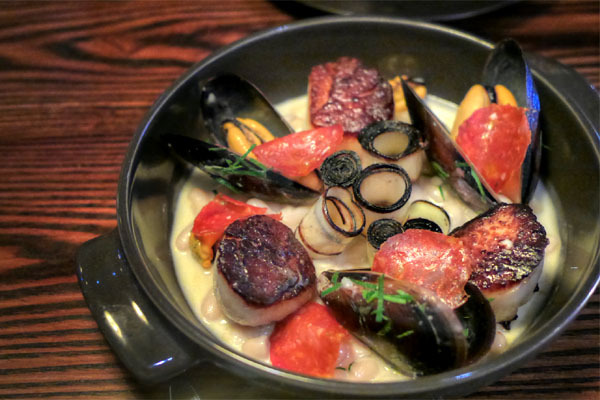 I was a big fan of how the spice of the chorizo elevated and accented the dish, as well as how the cannellinis moderated all the strong flavors at play. First up was the chocolate dessert, which set the classically sweet flavors of the ganache against juicy notes of tart citrus. Nice textures here, too. 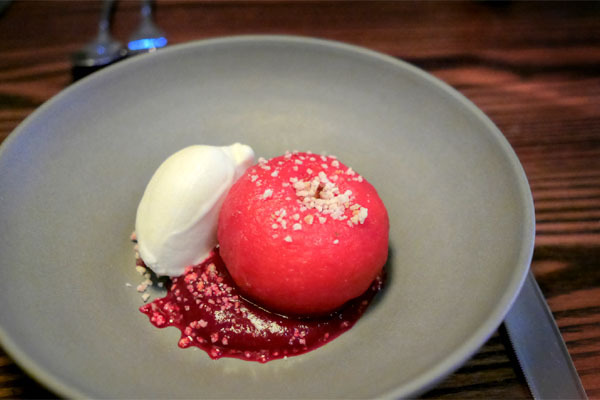 Our next dessert featured a sweet, spicy poached apple, a soft, yet still somewhat crisp rendition of the fruit that paired well with the nutty notes in the dish as well as the zip of that ice cream. 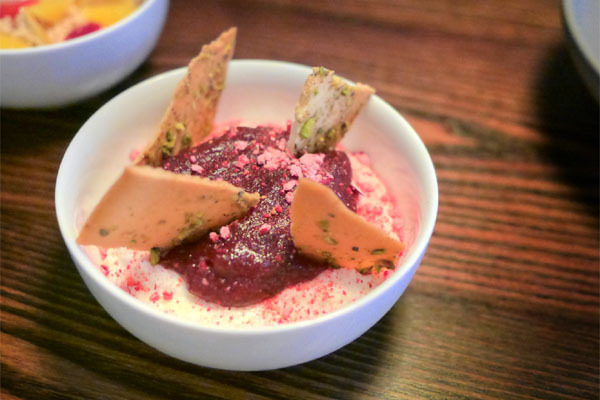 My favorite of the trio was the millet pudding, which had some great vanilla flavors that served as a base to the tangy cranberry and delightfully crisp and savory pistachio chips. Ostensibly based on a recipe from the Chef's grandmother. 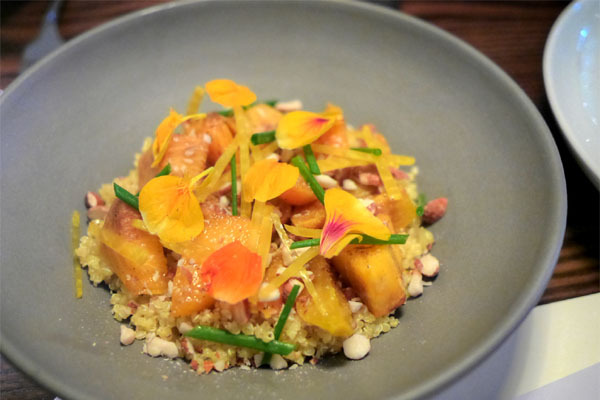 After a multi-year hiatus from the Southland, Alex Ageneau's back, and his cooking is stronger than ever, rooted in the classics, but with a modern, lighthearted slant that makes for a welcomed addition to Santa Monica's dining scene. I hope he keeps pushing things here, and as for what's next, the Chef teased that he's working on a smaller, higher-end place, so we'll be looking forward to that. Alex Is a awesome chef !!! bravo frenchy !!! !